Freight transport, or the movement of products and raw materials via truck, train, ship or plane, is a major source of unhealthy diesel pollution and other adverse impacts that disproportionately affect low-income communities, communities of color, and workers. Diesel truck and train traffic impacts the daily lives of residents of communities near ports, rail yards, freeways, and other freight-related land uses in the form of noise, traffic congestion, and pedestrian safety hazards as well as serious health problems like asthma, cancer, and heart disease. Freight truck and train traffic also contributes to reduced walkability and bikeability, neighborhood blight, and economic decline in neighborhoods hosting freight-related land uses, impacting longer-term neighborhood livability and economic vitality. The goal of the Pacific Institute’s Freight Transport Justice Project is to reduce the adverse impacts of freight transportation on community health and quality of life in low-income neighborhoods of color closest to freight transport hubs and corridors and to increase the share of the benefits that are enjoyed by residents of these communities. We build the power and capacity of communities to participate in decision-making regarding freight transportation and play a leadership role in local and regional collaborations working to win community health, job creation, and economic justice victories. We do so by working with project partners to carry out action research that makes the case for community solutions to freight transport impacts with decision-makers and by conducting leadership development trainings on freight transport issues with community residents. With our partner the Ditching Dirty Diesel Collaborative, we have conducted several action research projects that advance this regional coalition’s goal of reducing exposure to toxic diesel pollution in low-income communities and communities of color in the San Francisco Bay Area. These projects have ranged from quantifying the public health costs of freight transport operations on California’s communities so these would be considered in California’s Goods Movement Action Planning process, to mapping the potential for land use conflicts with freight transport hazards in areas slated for infill housing development as part of state climate action policy implementation in the Bay Area. With the West Oakland Environmental Indicators Project, we co-developed and co-facilitated a 16-hour Community Leadership Academy on freight transport, land use, and transportation planning to educate and engage West Oakland residents in freight transport decision-making. In October 2010, the Pacific Institute released Gearing up for Action: A Curriculum Guide for Freight Transport Justice, which was developed over the past five years with organizations and coalitions in other freight transport corridors and major hubs in the United States in order to build community power to address these common challenges. 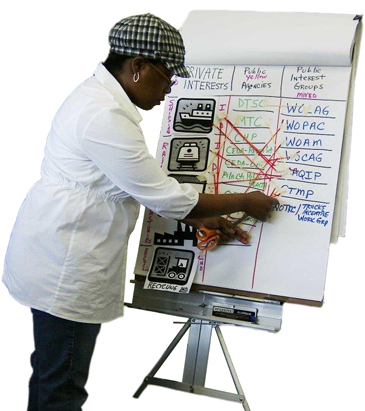 Currently, we are developing a training-of-trainers to share out these popular education curriculum resources and action research tools with community organizations and coalitions in other freight-impacted regions. For more information about our Freight Transport Justice Project, please contact Catalina Garzón, Program Director, at cgarzon (at) pacinst.org.